The choir performed a Christmas Cantata at church today. It went alright. But we ended a little too early so poor Mickey had to get up and fill the rest of the time "off the cuff". He had a little luck on his side. Earlier this morning he had to give a spiritual thought in a meeting so he was already kind of prepared. We bought a few Christmas books at an LDS bookstore last month. Honestly we just grabbed three not even really looking at them. We wanted a few books to read to the kids and they were already clearanced. How could we pass them up? One of these books is what Mickey used today. After the meeting was over he got a lot of compliments for his inspiring remarks and his ability for improv. If you can find a copy we highly recommend it. It's about how Santa got his start. 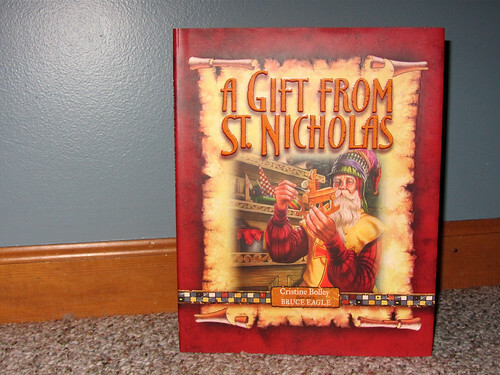 St. Nicholas was asked to help celebrate a very important birthday. It's very heart-warming.